I have witnesses to what I am about to tell you. When I was a teenager, I was also an evangelist. I wanted to be the next Billy Graham. When I couldn’t get anyone to stand still long enough to hear me preach, I would go out to Camp Bowie, Brownwood, where certain Cattlemen kept their cows. I would preach to those poor cows. I have to warn you, if a cow accepts Jesus as His or Her Lord and Savior, be careful when you baptise it. Cows are very difficult to baptise. Just trust me on this, OK? I fell from grace when I was in my 20’s. When I was in my early 30’s I repented, reaffirmed my relationship to Jesus Christ as my savior, and started evangelizing. What I thought was a repentance was not much more than me missing being a baptist. I even went to a baptist seminary. I discovered the depth of my “renewed” faith when something really awful happened. When that awful thing happened, God let me know in very clear terms that, if I stand with Him, He will guide me through this very hard thing. The weakness in my faith revealed itself, though, and I returned to that life of rampant sin and violence I lived in my 20’s, but I did it even more and to greater depths. When I committ, I go all the way, or no way. I don’t really have an in between. Four years ago, I discovered what the Cross of Christ is really about. I learned what terrible price Jesus paid for me. I learned He didn’t die for my sin, he died for me, OF my sin. All sin. Past present and future were put to death on the Cross with Christ. Eventually, I learned, as Paul pointed out, that when He died on that cross, and because I accepted that free gift, I also died with him. Now, I live by the grace of God through the measure of faith Christ invested in me (Galations 2:20). Before this revelatrion of Grace, the music my soul played was awful. I was awful. I hated everything and everyone. When people saw me coming, they left the room before I even got there. (Very true story, if you want witnesses, I’ll tell you who to call). After Grace happened, I saw everyone as someone Christ died for. Instead of wanting to harm people and hate people, I was filled with an understanding of the Love God has for everyone. I never knew such a spectacular love. 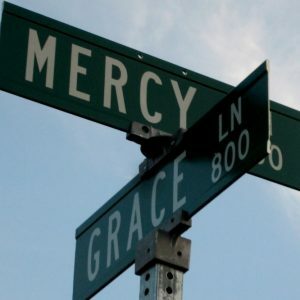 I never realized what Grace can do for a person. The grace of God, His mercy, His love, His free gift of salvation is spectacularly immeasurable wonderful. And it IS free to anyone who will accept it. Simple, right? Just after my real and very power conversion, another very bad thing happened in my life. This hurt goes deep to the bone, to the heart, through the soul. The difference this time is, I belong to the Living God through Jesus Christ…for real. I am determined to not repeat the mistakes I made the last time I was hurt this badly. I knew I was supposed to come to Colorado. My belief was that I would walk right into a ministry and serve. I want to serve so very badly. I figured that God was orchestrating this, too. I figured this because my getting here was a miracle in itself. I didn’t have the means to move to Colorado, but the means came to me, unbidden, in ways that let me know God was doing this. I got to Colorado. Pueblo, specifically. There is a reason God had me come here. I wanted to live in Colorado Springs, but God orchestrated things so that I ended up here, instead. I asked God what he meant. I’ll share His answer with you. See…for Christmas, I got a Slow Cooker. I am a terrible cook, but I am learning how to survive on what I make using the slow cooker. I am alone for the first time in my life, and have no cooking skills whatsoever. But I am learning. Last Thursday evening, I started up the slow cooker before I went to my Pilates class. I was praying while I was preparing. I was asking God when all this grief will pass, and when will I be allowed off the bench and into the game. After I got home from Pilates, the house smelled wonderful, but the meal was not ready. While I added water and some spices, I prayed again about my wanting to serve. Thursday, right after work, and before my Pilates class, I grabbed some ingredients and placed them in the slow cooker. I put in Salmon steak, rice, assorted vegetables, spices, and a can of Progresso Spicy Vegetable Soup. Each ingredient alone is good, savory, tasty, and delicious. Ingredients, however, are better when they are cooked together in a slow cooker. Ingredients in a slow cooker are not a meal until they have cooked at the right temperature and at the right pressure. It is a meal when it is the right mix (You wouldn’t drink a Sesame Orange marinade right out of the bottle, but you’d love the way it flavors your meal once it has infused into the rice and fish), and have been blended in a way that make a meal, and have cooked the right length of time. Time and temperature take care of the cooking. Eventually, the aroma of the thing being slow cooked starts to waft through the house. It smells good, but it is not a meal yet. After Pilates and my errands, when I walked into the house, my house smelled wonderful, but it still was not a meal. I had to get a big spoon, stir, add a touch of water, maybe a spice or two. (Some spices aren’t supposed to be added until a certain amount of cooking happens, and stirring agitates the blend of ingredients so that the flavor is evenly dispersed, and the food doesn’t burn (Thereby ruining the meal)). All this time, heat, pressure and effort goes into so simple a thing as slow cooking. There comes the point in the process that the aroma is so delicious that you KNOW intuitively, YOU HAVE A MEAL READY TO ENJOY. And that first bite tells the story, and is delicious and filling and…yummy. Serving a meal takes time and effort. The bitterness of some vegetables is removed during the cooking process, and they become sweet or savory vegetables when it is time to serve them. Salmon is a great protein, but you cannot eat it frozen and shouldn’t eat it raw. But when it has been properly prepared, it is delicious and succulent and savory. That is what it is like to be prepared for His service. God has to prepare his servants. We are to give up our individual identity and be part of something greater than us. We are to be altered to the point where we are no longer inedible, but are savory and inviting. Service is not a part-time hobby. God’s true servants give up their identity and very lives for God. When we are a pleasing aroma in His nose, then we are ready to be served up to a hungry world in need of answers. And we will be consumed by serving, because, Like Christ, we are to be completely consumed by our call. A hungry soul is looking for something he can sink his teeth into, and the soul that belongs to Satan wants to destroy God and all His servants, and throw us out. Either way, we cannot be accepted or rejected until we have been properly prepared to be the meal offering that God needs us to be. That is the lesson God showed me while I was impatiently waiting for the timer on the slow cooker to ding. If, like me, you want to be served up, you have to wait for God to prepare you, temper you, stir you up, put you under pressure, and strip you down until you are no longer your own, but part of the Free Gift he is serving to a dying world. It takes time and patience. was not mine, but I was keeping it for my Master. He asked if I knew much about gardening. “Well, of course, I do!”, I replied. “Have you been a gardener so long, yet without fruit? Do you know all about the soils, yet have not tilled one foot of furrow? Are all the seeds familiar to you, but you have not put one into the ground? What kind of Husbandman would let his masters’ garden fall into such disarray? You boast of being a gardener but have no fruit for all your knowledge.